Gluten-Free Cinnamon Rolls. 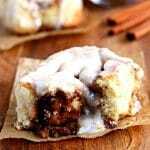 Swirls of cinnamon and sugar in a soft gluten-free roll topped with a vanilla glaze. The recipe also has a dairy-free option. 3 1/2 cups all-purpose gluten-free flour , I like Pillsbury gluten-free flour. Not all gluten-free flours are created equal. You may experience different baking results depending on the gluten-free flour blend you choose. Pre-heat your oven to 100°F (the bread proofing setting). Once it gets to 100° turn off your oven. Add the granulated sugar into a large mixing bowl. Crack two eggs into a small bowl and whisk. Allow the eggs to come to room temperature. Warm the milk to 110°-115°F. I microwave the milk in a glass measuring cup for 1 minute. I also use a thermometer to check the temperature. If your milk is too hot it will kill the yeast. Pour warm milk over the granulated sugar and stir to combine. Pour the instant yeast over the milk mixture and allow to it to bubble up for a few minutes. Melt the butter in a glass measuring cup or small glass bowl. Make sure the temperature of the butter is not over 115°F before you add it to the milk and yeast mixture. Pour the whisked eggs and the apple cider vinegar into the milk mixture and mix until fully combined. I used the dough attachment to my KitchenAid stand-up mixer. Add the gluten-free flour, baking powder, salt, xanthan gum (leave out if your flour already has it). MIx on medium speed (6 on KitchenAid) for 5 minutes. Scrape down the sides when needed. Your dough will start to pull away from the sides of the bowl. The dough will be tacky and soft. It should not completely stick all over your hands but should feel tacky and not dry and floury. Do not add more flour! Place dough in a greased oven proof bowl and cover with plastic wrap. Cover the bowl with a towel and place in your warm oven for 1 hour to rise. During the last 10 minutes of the dough’s rising make the filling. In a small bowl with a hand mixer cream the softened butter, brown sugar, ground cinnamon, and pure vanilla extract together in a small bowl to make the filling. Remove the dough from the oven and preheat the oven to 350° F.
Place the dough on top of a floured parchment paper and shape it into a rectangle. Dust your rolling pin with gluten-free flour and roll out to about 1 inch thick. Carefully smooth the cinnamon, butter and brown sugar filling over the top of the dough. Leave 1/2 inches bare (filling-free) on one long edge. Using the edge of the parchment paper, fold the edge up. Doing this will help you start your first layer in the rolling of the dough. Pull the parchment paper down slowly back to the counter. Now you have the start of your roll. Slowly roll the dough to form a log shape. Then cut the log into 12 equal rolls. Place the rolls in a greased 9×13 baking dish. (I use a coconut oil spray) Bake for 25-30 until they are light golden brown. Please watch your oven because all ovens are different. Make either the vanilla frosting (thicker) or the vanilla icing (thinner). Allow the cinnamon rolls to cool for a few minutes before frosting them or drizzle them with the icing. Enjoy! Store in an air-tight container. Reheat in the oven or microwave (about 30 seconds). The cinnamon rolls are best when eaten warm. If you have any left-overs store in an air-tight container and reheat before eating. You can reheat in either the oven or the microwave (about 30 seconds).